Starring: Audrey Tautou, Mathieu Kassovitz, Rufus, Yolande Moreau, Artus de Penguern, Urbain Cancelier, Dominique Pinon, Maurice Benichou, Jamel Debbouze. Director Jean-Pierre Jeunet’s collaboration with co-writer/director Marc Caro resulted in a couple of marvellous and inventive films in “Delicatessan” and “The City of Lost Children”. Those two had a dark element to them but now that Jeunet has went his own way, “Amelie” shows that he is the one that possesses the lighter side of the duo. In the heart of Paris, Amelie (Audrey Tautou) brings joy to her friends, secretly sorting out the sad little problems in their lives. But when she discovers a strange photo album belonging to Nino (Mathieu Kassovitz) she realises that she is in love and has problems of her own to sort out. I struggle to think of a contemporary film that boasts such richness in detail and creative, infectious enthusiasm as ‘Amelie’ does. It’s playfulness, poetry and emotion are rarely touched upon these days in film and director Jean-Pierre Jeunet deserves applause for his uplifting achievements here. It’s also stunningly shot by cinematographer Bruno Delbonnel (inspired by the paintings of Brazilian artist Juarez Machado) lending an artistic look to the highly creative and artistic content. Without being overly elaborate though, it finds its art in the simple things in life, observing people’s individual pleasures and pains. Quite simply, the whole film is a complete joy to behold. The performances are also delightful. As much as I’m an admirer of actress Emily Watson (whom the role of Amelie was originally intended) I’m glad the relatively unknown Audrey Tautou got the part. She is absolutely adorable and captures the essence of this wonderful character perfectly. With flair and originality that’s hard to come by these days, ‘Amelie’ is one of the most beautiful pieces of cinema I have seen and will always be one of my favourites. The humour; the look; the characters and performances; the delightful and fitting music by Yann Tiersen all culminate into the ultimate feel-good film and confirmation of the creativity and inventiveness of French cinema. A heartwarming modern classic. This entry was posted on February 2, 2012 at 6:58 pm and is filed under Comedy, Drama, Fantasy, Foreign Language, Romance with tags 2001. You can follow any responses to this entry through the RSS 2.0 feed. You can leave a response, or trackback from your own site. I had to scroll through a few to find a movie I had seen so that I could have a reference point for your assessments. 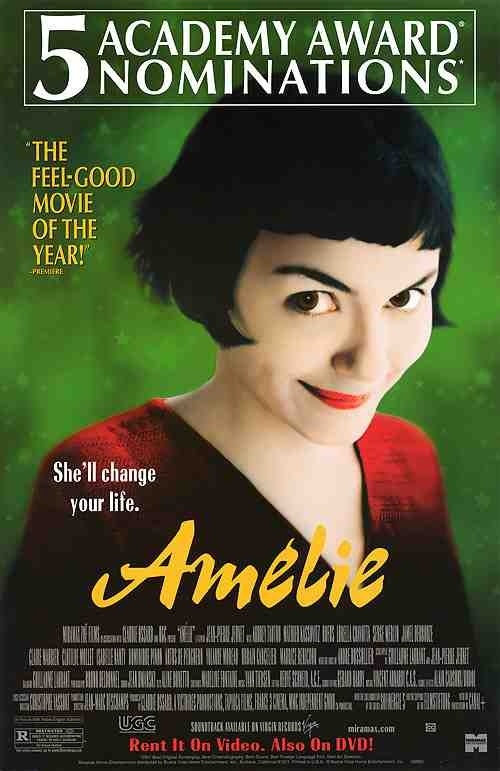 In this case I totally agree – Amelie is a wee gem of a film that really warmed my jaded heart when I saw it. I find a lot of French film contrived. None the less, I have often found myself savouring the contrivance. This is how I look at Amelie – an imaginary Paris laid out for the viewer to rediscover an ounce or two of kindness and wonder in themselves. A lovely way of putting it Wommmbat. I agree also. I have a slight problem in the structure of my blog, im hoping to add menus and an index where it will make it easier to navigate and find an excat post but im still finding my feet with this. Just popped over from FMR to says thanx for turning Fogs on to this. I loved it, a real mood changer for a rainy day. Here’s a bit of Tuesday Trivia, Jeunet was offered “Hellboy” before Del Toro. Tres interessant. Thanks for swinging by Ray. Yeah, when Fogs gave out a shout for recommendations, I had to deliver this one. I gave him more that he will get around to but chose to begin with this. Such a beautiful and heartwarming gem of a movie. It’s in my personal top ten. I can’t can’t get enough of it. Nice info on Hellboy, man. I mist remember that one for future posts. Thanks again Ray.